Using the Stampin Up petal cone die cut, I have been putting together paper cones using the Kiss Me Collection by RhonnaDESIGNS. I am officially in love with these papers. I am officially in love with the vintage feel and nature of this kit. I will officially be sad next week when the making and creating of all things Valentiney will be over. 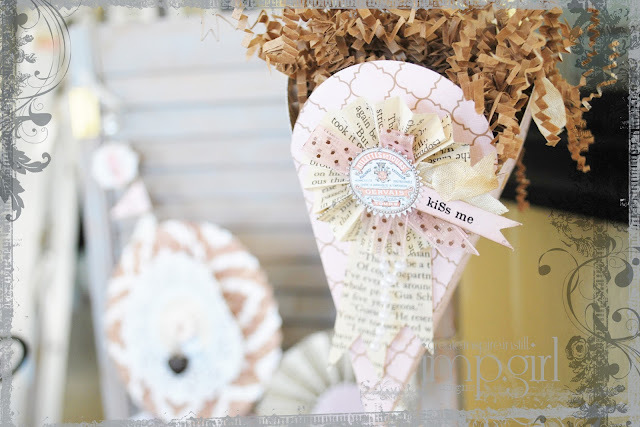 The striped cone includes the banner piece from the KissMe border kit. 1. print banner piece on cardstock. 2. fancy cut the banner. 4. cut out the heart templates. 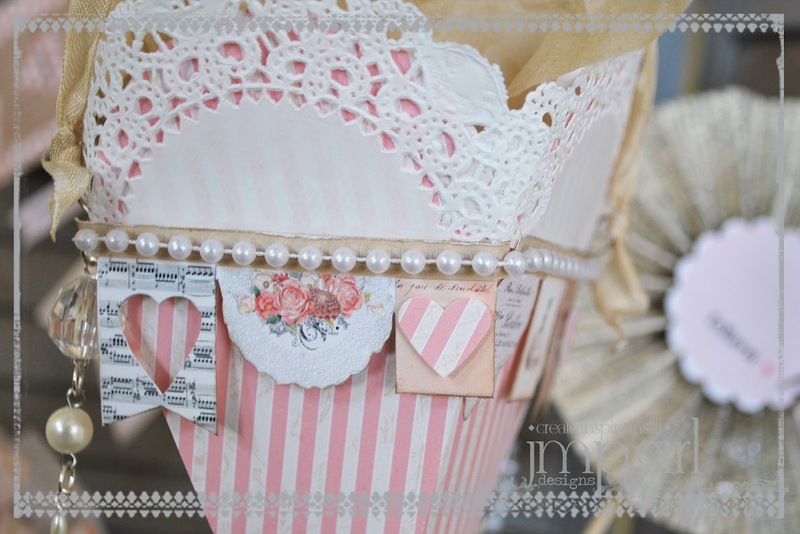 5. punch hearts out of pattern paper and adhere to banner. 6. attach banner to petal cone. Not everyone has this die cut, I know. The only reason I have it is because my dear friend Bonnie let me borrow hers...after she inspired me with a cone she made for me. (an amazing talent she is). So, if you too don't have the die, make a paper cone, follow this template, and you can have the same results. Use tissue and fringe scissors to make an easy and quick filling. 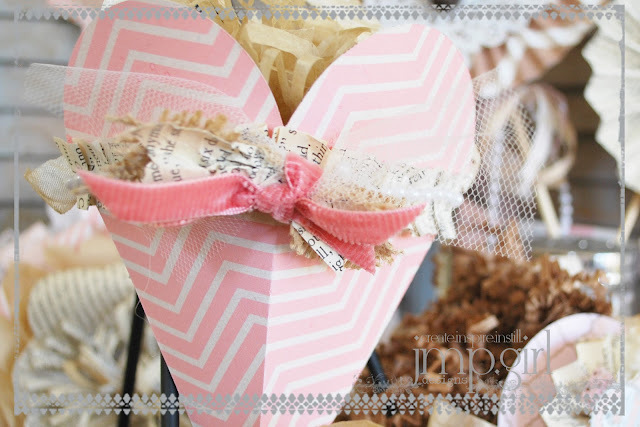 But certainly, don't forget to fill the cones with something sweet for your sweetheart. 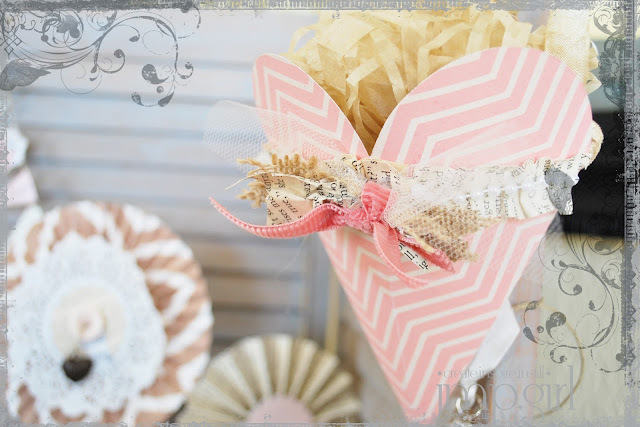 The chevron cone was embellished with things simply found in my studio. I made a book ruffle and attached to the cone. A string of pearls layers on top of the ruffle. Then a little junque bow was added to the corner. 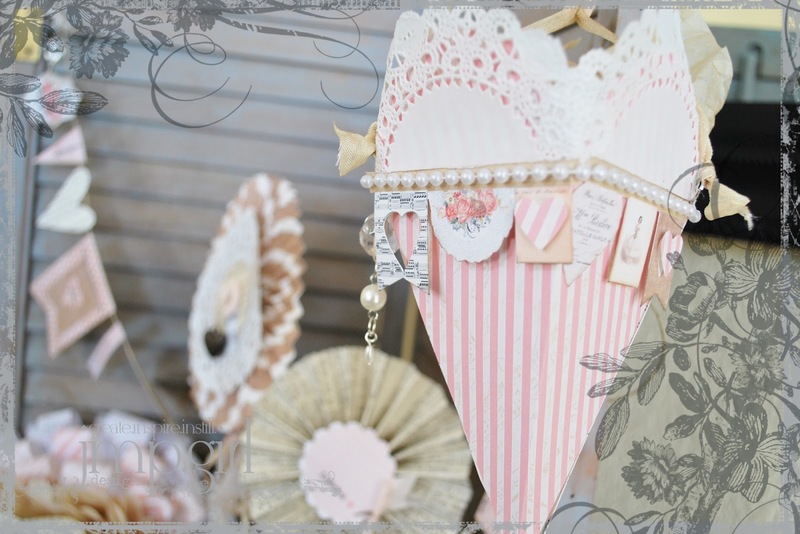 The canvas quatrefoil cone...my fave! 1. make lolly from vintage book paper. 2. layer sheer ribbon and coffee dyed seam binding on top. 3. starburst punch label from collage plain paper pattern. attach to the top of the ribbons. 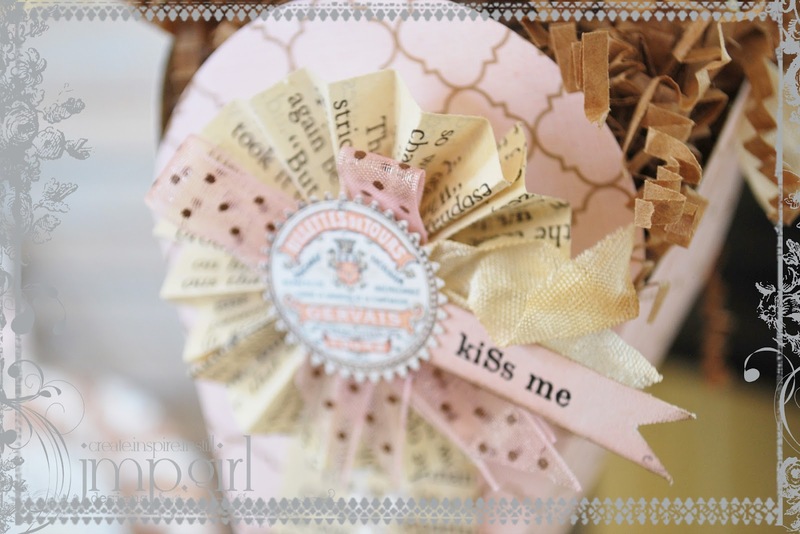 4. snuggle the 'kiss me' flag from the kiss me printables flags n tags under the label. 5. use paper shreds (love me the kraft color) as filler to the wonderful gift you will be sharing with your valentine. Gorgeous…I too made some pretty Valentine decorations using Kiss Me.. I even used Punk Junque to and Rhonna's Handwritten Valentines to make my kindergartners Valentine cards for his class. I love everything you made…colors are beautiful. When I first got Kiss Me I recolored everything to a more pink color because everything have is pink. Then I received my Gilded Girl Stash Society box this month and it was full of goodies…you know where this story ends right? Everything was the same color as Rhonna's peachy Valentines. I ended up mixing the colors and I think it looks terrific….I don't have it all done but what is done looks great. I even used a junque bow on one of my bottles. I see you too are still as addicted as I am to them. Question…on the border doily that you used on the cone..how did you cut that? I'm so bad at fussy cutting- did you fussy cut or did you use a punch? Sigh.......I am in LOVE with these, Jamie! Absolutely smitten! i just love your cones ... and the detailllsssss ohhhhhhhhhhhhhhh so gorgeous!